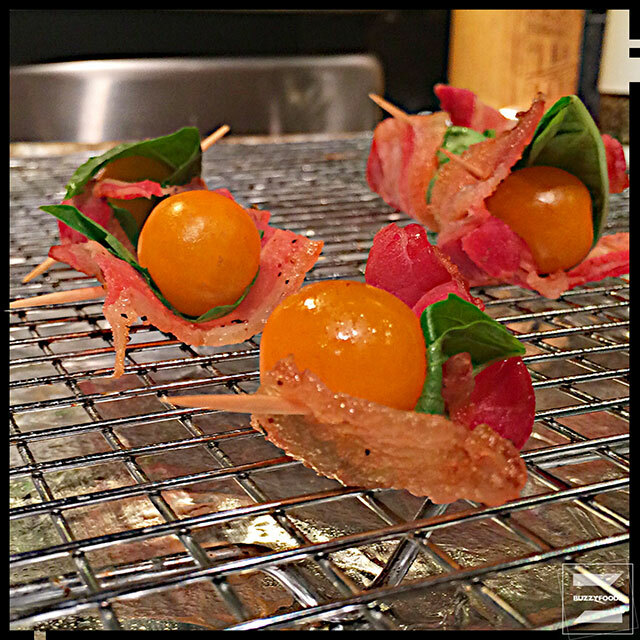 wrap a cherry or grape tomato with a basil leaf, then wrap ’em both with a bit o’ bacon. Well… it would be, but mom’s note basically said just that, and then to grill until done. So, I was left with some decisions. 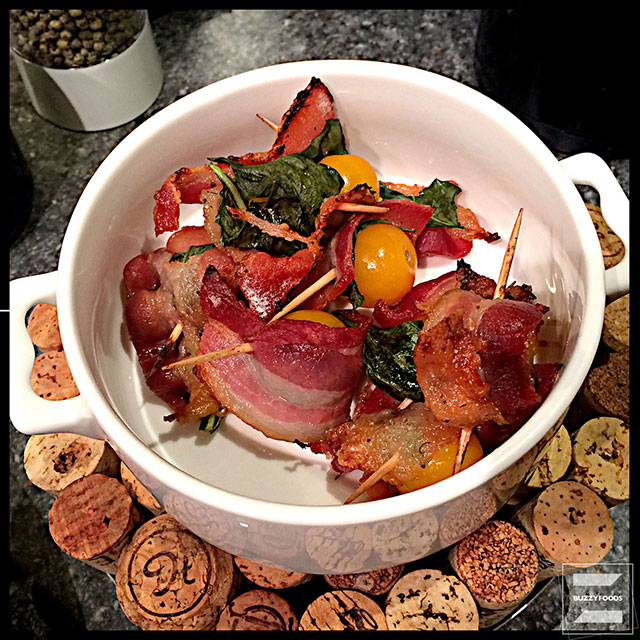 I opted to pre-cook the bacon a bit in the ‘wave, then finished it wrapped around the tomato and basil in a (very) hot oven. Nice, but next time (like, mebbe this coming Thanksgiving), I’ll just wrap the tomato and basil in raw bacon and do the whole thing a bit longer in that (very) hot oven. Heat your oven to 450º (I told you it was very hot) and apply a bit of cooking spray to a rack fitted into a foil lined baking pan. Slice the bacon in half and sprinkle with a bit of your favorite steak seasoning – I used Gateway to the North Maple Garlic. 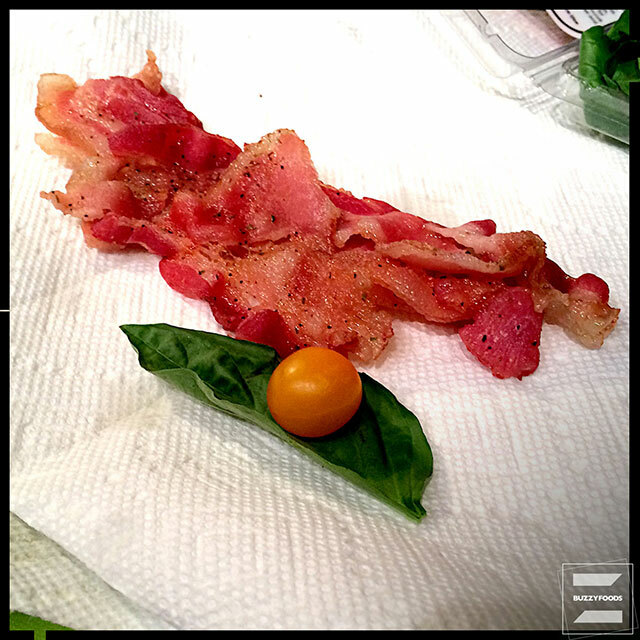 Wrap each tomato with a basil leaf, then with a half slice of bacon and secure it all with a toothpick As noted above, I pre-cooked mine for about three minutes in the ‘wave, and don’t believe I did myself any favors. The partially cooked bacon was tricky to wrangle, and I think the tomatoes would’ve benefited from longer in that (very) hot oven. 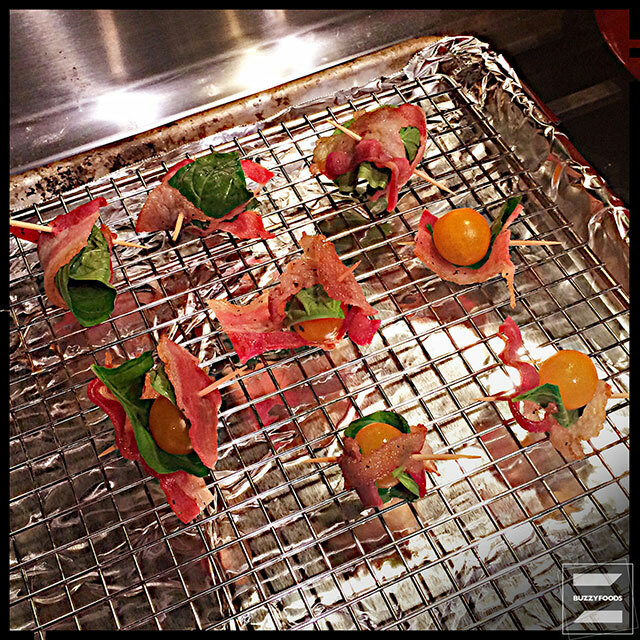 Arrange the bacon, basil, and tomato wraps on the rack and pop ’em in the oven until the bacon is done. Mine took about five minutes, and were really quite nice, but I’m thinkin’; start with raw bacon, cook those puppies for ten minutes, just until the bacon is done and the tomatoes are almost bursting, and you have yourself a real winner. Either way, an almost stoopidly good munchie in next to no time. Try it yourself and see if you don’t agree. 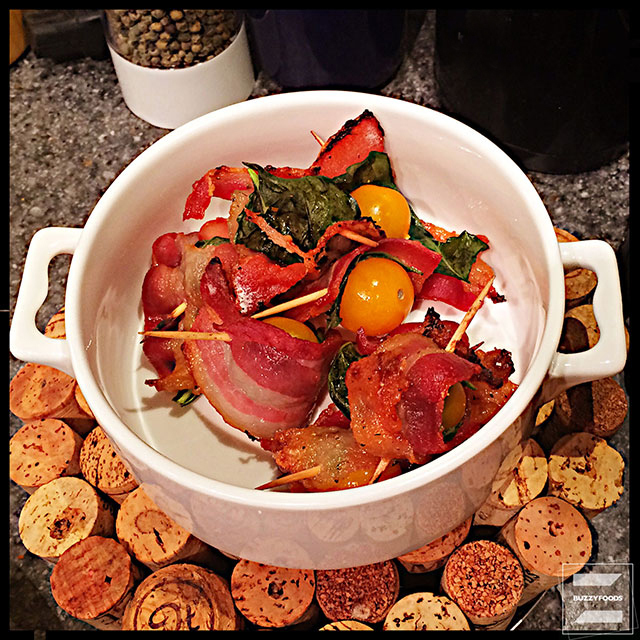 This entry was posted in Appetizers/Munchies and tagged Appetizer, Bacon, Basil, Cherry Bombs, Cherry Tomato Bombs, Cherry Tomato Wrapped in Basil and Bacon, Cherry Tomatoes, Grape Tomatoes, Munchie, Thanksgiving, Tomato Bacon and Basil. Bookmark the permalink.